When my husband told his co-workers that he had given into his crazy cat lady wife and agreed to getting a 10th cat, they said he had been 'railroaded.' 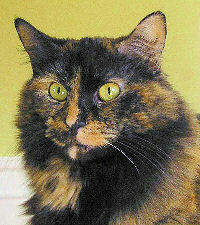 How ironic that on February 2006 we adopted Railroad as our 10th cat. 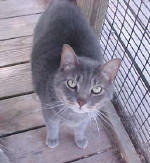 Railroad is an 9 year old FIV cat who had been at the shelter for 3 and a half years. When he first arrived at our house/shelter for wayward cats, Railroad was very shy and hid under the bed in our guest bedroom. That all changed on Turkey night (when Bud was with us every Thursday we use to serve our cats a delicious plate of turkey breast), when Railroad came out of hiding and stole Mona's (Pat Brody alum, class of 2002 and 2003) turkey. Since then, Railroad has become quite social, particularly at night when we are trying to sleep. At times, he loves to cuddle between Noah and I and he purrs real loud. Back in the spring we brought Railroad in for some dental work. He ended up getting thirteen teeth out. His recovery was very slow. Two months ago Railroad got very sick with a bad case of pneumonia. His temperature was 106 and he was going down hill. After one month of Baytril, Sub Q fluids and force feeding Railroad pulled through. He manages to eat dry food with only five teeth left. His favorite treat is Whisker Lickins! 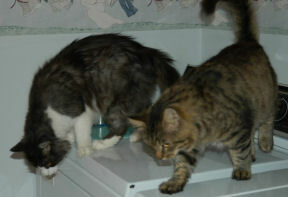 Here he is on the left eating treats with Skippy and LB all from Pat Brody shelter. He also loves turkey! For the past two months each night I have been feeding him (high quality can food along with lysine and Mega C vitamins) with a spoon. 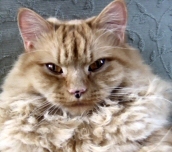 His appetite is not always good because of the stomatitis (gum disease) and FIV. We are suspecting that Railroad must have been FIV for many years because he is showing many signs of the disease. 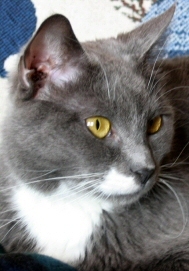 FIV cats can live for many years. The most important thing is that he has a home and he is happy. We are happy that Railroad is a part of our family, and hope that others seeking to adopt cats at the Pat Brody Shelter will give seniors and special needs cats a chance at a loving home. We have been meaning to write for a long time now about how happy we are to have welcomed Sunny and Elsie (formerly Mona) into our home. They came home with us at the end of March 2006 and we feel we got more than we expected with the affection and love and entertainment these two provide us. Sunny is a stitch who likes to sit up like a person and is always ready to play. Elsie is a lovebug who shares the bed all night long and any time we sit down for a moment. 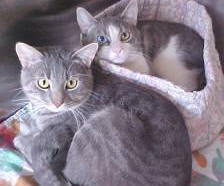 Thank you for harboring them, and all the kitties in your care, until we could find them to be part of our family. We adopted Emily and Nigel a year ago, and we just wanted to let you know how they're doing. They've been wonderful additions to our family. Nigel is a big, playful 20-lb. kitty who loves to have his belly rubbed. He also wins the prize for the loudest purr, which we can hear from the next room! He's definitely full of personality. Emily is absolutely the sweetest cat, and she's so affectionate. 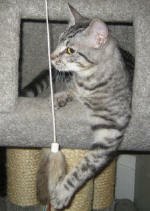 She's also playful, and loves to run around the house at record speeds and roll around with her catnip toys. We love our kitties! Just wanted to say hi and let you all know the 2 cats we adopted last year are doing wonderful, (frick and frack) now (Max and Popeye) popeye had a lot of medical problems with an eye shortly after we brought him home, he was taken to an eye specialist , and unfortunately he lost the sight in one eye. His health aside from the blindness is awsome, they are both healthy and very happy in their new home. They are both loving, wonderful cats. Had to send you an update - what a great cat Noah is!! Ann got home and left Noah in the carrier to let her other kitty, Peanut smell him. No hissing or spitting so she let Noah right out of the carrier. He then proceeded to check out both the downstairs and upstairs - jumping up on beds, chairs, desks etc with Peanut following his every step. Still no hissing/spitting. The other night, Noah crawled up on the couch with Ann's husband - so Noah laid on one side and Peanut on the other. Peanut inched his way across her husbands lap until he wedged himself between Noah and him. Noah just looked up - saw Peanut right next to him - and put his head back down and fell asleep. The next morning the chase began...Peanut in full pursuit of Noah up and down the stairs. At first Noah didn't know what the heck was going on - then realized Peanut was just playing. They are becoming good buddies. Ann cannot believe what a calm kitty Noah is. She said all he wants to do is eat, sleep, be brushed and be loved - she said NOTHING bothers him. I came in and adopted Tiffany (actually she adopted me!) on Saturday. (Her name has been changed to Lissi.) I just want you to know that she has adjusted very quickly to her new home. She adores my husband and he is very happy with her. We're keeping her in our spare bedroom for awhile until our other cat Bilbo is more comfortable with her. He is a bit uneasy right now, but he doesn't try to go after her when he sees her, so I think he'll come around pretty soon. We put Bilbo in another room for a couple of hours each day and let Lissi explore. She seems to have no problem with us or our dog, who finds her very interesting and is constantly trying to be very close to her. I think she knows that this is her true home. Thank you for all you do for these unfortunate cats. I hope they'll all find homes soon. Happy New Year to everyone at the shelter. I wanted to give folks a 3 month update on Geyser/Tweedledee. He is sitting on my lap and looking up at me adoringly as I type and has a good purr going. He is long over his ear infection and parasite and weighs 6.5 lbs. He jumps my cat Griffin every chance he gets and can't decide once he jumps him to bite him or lick him. Griffin looks around every doorway now for the excitable little tabby and tries to elude him. Geyser chases him a lot and is hopefully keeping him young. I can't imagine my home without Geyser; although I'm sure Griffin can. He doesn't jump on my shoulders anymore and is content to just be held like a normal cat. He does jump into the refrigerator occasionally and likes to sleep on top of it in a basket. He also sleeps with me every night and is normally on my pillow right next to my face. I often tell him that he's a very lucky cat to find such a good home and to be so loved. and also tell everyone about where I got him and about the shelter. I hope this note finds everyone both human and feline doing well. Thanks..
Just wanted to send you a quick update on how Cosmo & Duncan are doing together in their new home in Dunstable. They eat together, they jump together and they play together. I just wanted to drop a quick note to say thank you for helping us find such a wonderful little cat. We adopted Nadine (now Saffron) yesterday, and we couldn't be more pleased with her. She was understandably nervous for the first few hours, but we were amazed at how quickly she emerged to explore the house, play like mad, climb the cat tree, and try to make friends with Jetson, our other cat, who is slowly but surely accepting her as his new friend. We are soon moving to a house with a fenced-in yard, but still we will keep her indoors. She has been through too much in her young life. She has many toys and we play with her for a couple hours every day, also Mike works from home so she always has someone around. Now Jetson has fully accepted her- they sleep next to each other every night. We still don't pick her up much- she clearly doesn't like that- but she is a great snuggler and climbs into our laps when we're reading or watching TV. She is a jewel. 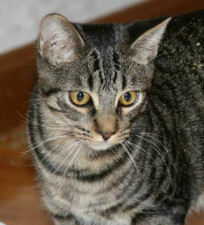 She is smart, playful, elegant, and very affectionate- a perfect cat. Thanks again- I am telling everyone about your shelter! Just wanted to drop you a note and tell you that both our Pat Brody kitties are doing very well. 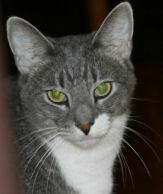 JJ was six months old when we adopted him in October 2004. He has grown up into a very hansom, well behaved cat. He has an interesting story, he had to have knee surgery on both back legs because his knee cap (patella) was sliding out of place. Dr. Easley from Townsend Vet did a great job on the Little guy. Marco is an awesome kittie. Full of energy, and very very friendly. He definatly livens up the house. I included a photo of JJ and one of Marco. It was hard to pick out of all our photos of the cats! The one of Marco is just after he was enjoyed a roll in some catnip.